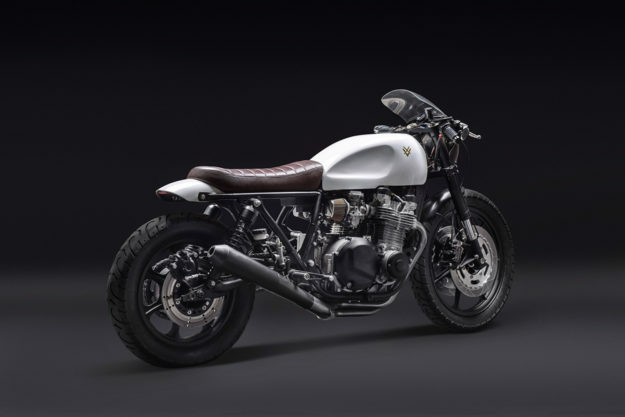 Custom trends will come and go, but the art of the resto-mod will always have a place in the pantheon of motorcycle culture. And one of the finest exponents of the genre is Stefano Venier. 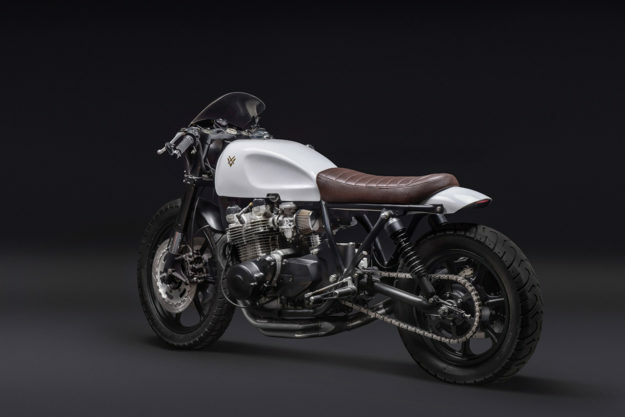 Stefano’s bikes always remain true to their original purpose—but they do it a little bit better, and with a lot more style. 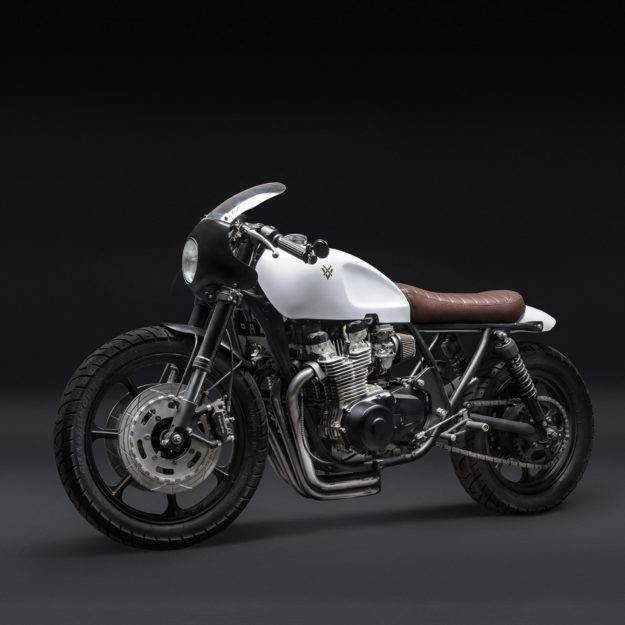 This thoughtfully upgraded Kawasaki KZ 1000 LTD runs true to the Venier form, replacing the fripperies of a typical early-80s cruiser with a sleek and timeless silhouette. 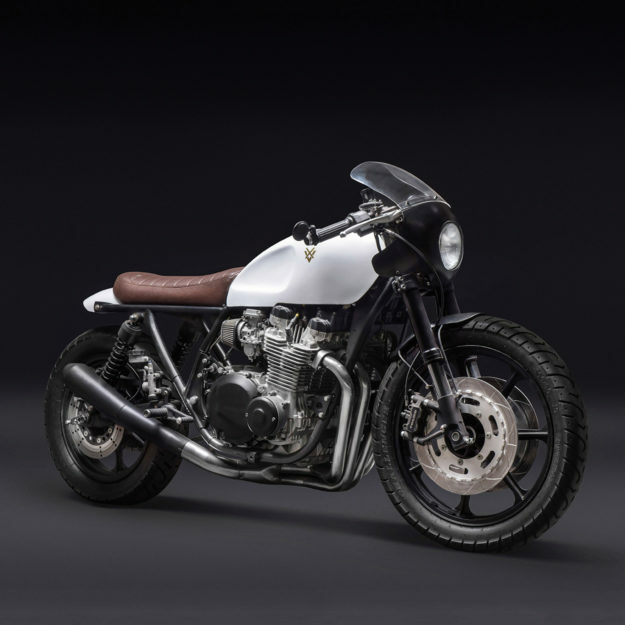 The KZ1000 is called Giappone (‘Japan’) and was commissioned by San Francisco-based angel investor and entrepreneur Brett Seyler, a man with a passion for the analog pleasures of riding. Stefano is obsessive about quality, and works with top-class craftsmen to get the results he wants. In this case, fabricator Lou Neziri modified the original Kawasaki tank to subtly change its lines, and add cutouts for the rider to grip. 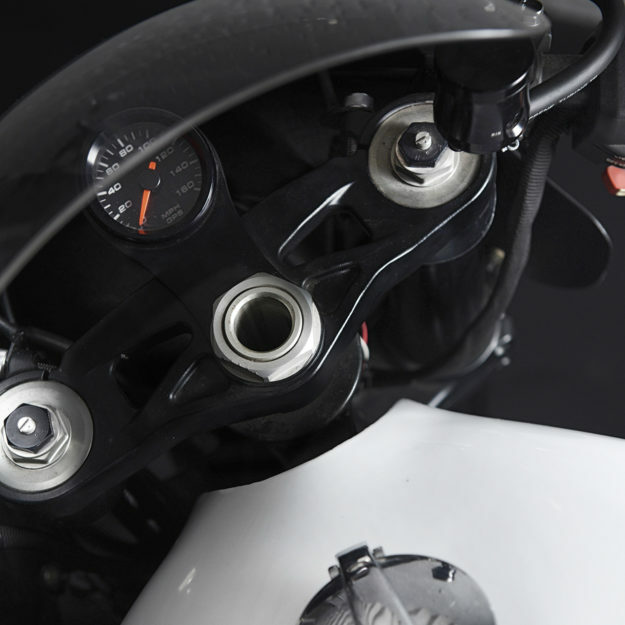 The bikini fairing is the bare minimum required for windflow deflection; it’s a competition version of the Le Mans Mk 1 quarter fairing, originally supplied with a filled-in headlight opening for racing. The heavy lifting is at the front end, performed by workshop wizard Erik Green. The forks and front brakes are from a Honda CBR1000RR Fireblade, upgraded with custom rotors—a significant leap in performance beyond the spindly originals. The rotors have been custom-made to work with the original Kawasaki wheels, which still look good 36 years on. To get the new forks to fit without changing the geometry, the KZ1000 steering neck has been modified to accept the Honda triple trees. New progressive shocks hold up the rear end, linked to a modified rear frame—which now supports a discreet fender and a very elegant brown leather seat. 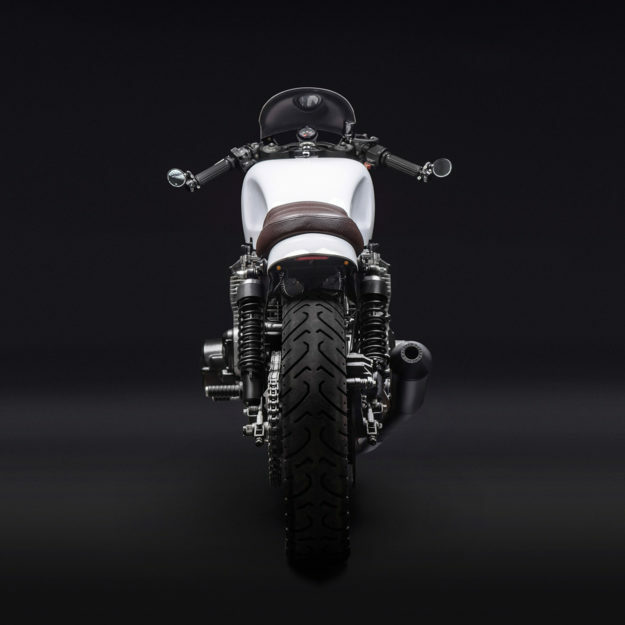 Underneath the seat is a small lithium battery and a Motogadget m-Unit control box, which is wired up to bar-end turn lights and grips from the same company. The speedo is a GPS unit—which does not require a transmission sensor to operate, and locks on to GPS satellites within three seconds of powering up. 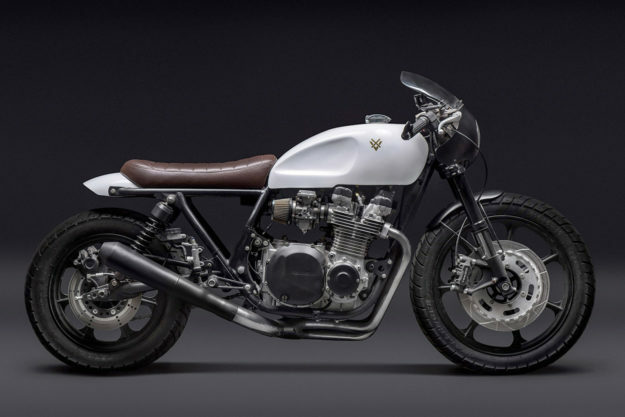 Most older bikes require an engine upgrade to make modern-day power, but the KZ1000 is an exception. The DOHC, air-cooled inline four pumps out a very solid 90 horsepower. That’s about the same as Indian’s current 1100cc Scout, because the Kawasaki doesn’t have modern emissions regulations to deal with. Still, Stefano couldn’t resist adding a little extra pep (and a rasping exhaust note) via a modified Kerker exhaust system. The finish is beyond factory levels, with only discreet gold Venier logos breaking the understated black and white paint—all expertly applied by Mr. Neziri. 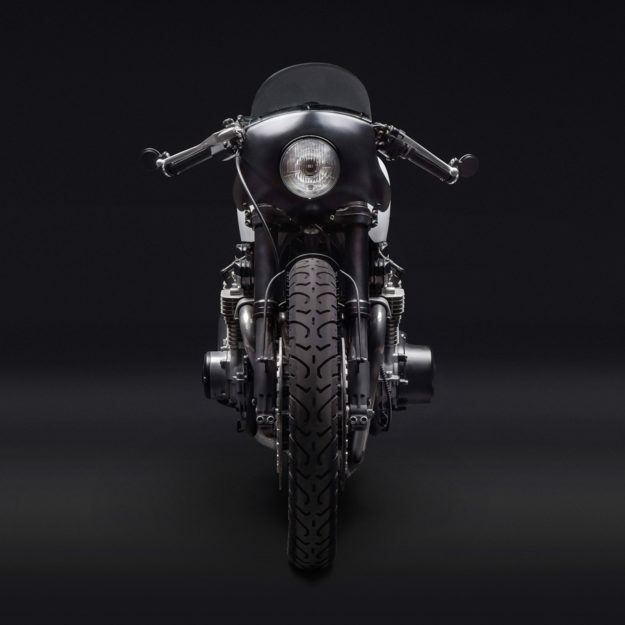 It’s the kind of build that will never go out of style—the motorcycle reduced to its purest form. More, per favore.